Aristotle, Inventor of Science? Yes, says Professor Armand Leroi! Today’s “Books” discussion on Tom Ashbrook’s radio program “On Point” features Armand Leroi, professor of evolutionary development biology at Imperial College (London). Professor Leroi explain the core assertions of the new book “The Lagoon: How Aristotle Invented Science” and responds to the calls and online comments of listeners to the show. You can also read an excerpt from Professor Leroi’s book on the “On Point” website. This entry was posted in Uncategorized on September 29, 2014 by msafran. Uma Thurman is no stranger to Greek myth, having played Medusa in Percy Jackson and the Olympians: The Lightning Thief. This past summer, she starred in a short film, “The Mundane Goddess” Thurman plays a modern-day Hera driven to therapy in this prize-winning project from the Jameson First Shot filmmaking competition. This entry was posted in Uncategorized on September 25, 2014 by msafran. Boston’s Museum of Fine Arts has reorganized its Greek ancient art collection by theme. What’s the way to see classical art—by the year or by the theme? “These themes are at the heart of Greek culture,” says the museum’s curator of Greek and Roman art, Christine Kondoleon. This entry was posted in Uncategorized on September 20, 2014 by msafran. Read on, at the NewYorker.com. This entry was posted in Uncategorized on September 12, 2014 by msafran. Enter the Labyrinth with Theseus–in a comic book! 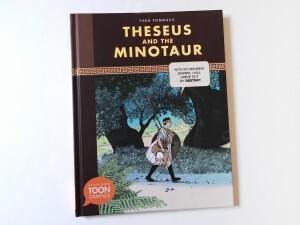 As Robert Ito reports in the 8/30/14 issue of The New York Times, Toon Books has released a comic book retelling the famous Greek myth “Theseus and the Minotaur” by Yvan Pommaux, and Daniel Tandarich’s fifth-grade students at Brooklyn’s P.S. 124 love it! This pedagogical experiment affirms the vision of Francoise Mouly, the New Yorker‘s art editor and creator of Toon Books. Soon Toon Books will release a retelling of Orpheus in the Underworld! This entry was posted in Uncategorized on September 6, 2014 by msafran.